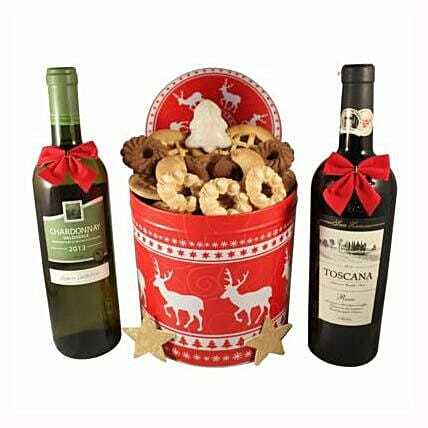 Large Christmas Cookie tin box Gift is perfect for Christmas Morning across Europe! Surprise your friends, family, coworkers, employees or clients with a wonderful 1Kg (35.27 Oz) cookies selection designed with Christmas tin box and dual Italian Chardonnay White Wine 750ml with Tuscan Red Wine 750ml. Store your chocolates in the refrigerator.If they are exposed to high temperatures, they may begin to soften, compromising the appearance and flavour. Please refer to the expiration date on the package and consume your chocolates before that.